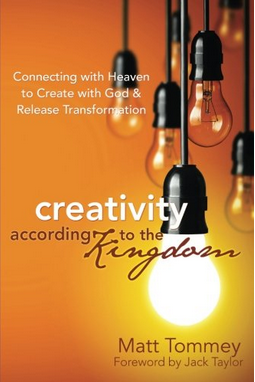 Books: "God's Creative Gift" & "The Creator's Healing Power"
Music: About "Song of the Beloved"
Continuing our National Book Month focus on books for creatives, artists and worshipers, I’d like to introduce you to several books from Matt Tommey of the Worship Studio. 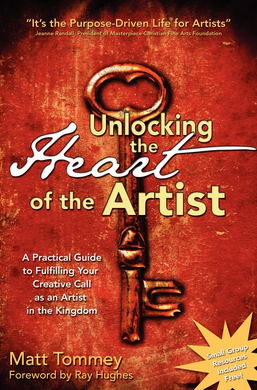 The first is Unlocking the Heart of the Artist: A Practical Guide to Fulfilling Your Creative Calling in the Kingdom. According to Jeanne Randall, President of Masterpiece Christian Arts Foundation, “It’s the Purpose-Driven Life for Artists.” I love that it touches on the importance of working towards healing and wholeness. There is also a companion guide resource with journal prompts and project ideas to help you on your healing journey. You can find out more about Tommey’s books at The Worship Studio. P.S. Missed previous posts? Click here. What is Create-A-Day? Just as One-A-Day® Vitamins help restore the nutrients we deplete in our bodies, so too do we need to refill, replenish and renew our creative souls. In 2015, watch for daily* posts to undergird your ministry; lead you to resources to nurture the creative spirit within; and draw you more deeply in worship of Jesus Christ. My goal is to provide you, the creative Christian, with over 250* resources to help you develop your ARTistry, CREATivity & capacity for BEaUty. Books, worship arts ministries, video series, websites, conferences—all geared towards artists, creatives, worshipers and people serving in worship and creative arts ministries. So, visit my blog every day* to see what creative resource I’ve hunted down for you. You can stay connected by following me on Twitter or Facebook. Or better yet, sign up to receive email updates by clicking the button to the left. We’ll watch the resources pile up as the year unfolds! * I am a proponent of family time and Sabbath rest so don’t look for posts on weekends or Holidays. Jody Thomae is the author of God’s Creative Gift—Unleashing the Artist in You, a devotional book with Bible studies to nurture the creative spirit within and to serve as a resource for creative Christians, artists, musicians and worshippers. She has been involved in worship arts ministry since 1997, coordinating artistic involvement in church services and regional worship events through dance, drama, poetry and fine arts. She performs, teaches, choreographs, preaches, coordinates and leads workshops in the area of creativity, spirituality and embodied prayer. She has also recently released a devotional CD, Song of the Beloved. Her passion is for the revelation of God to be made more real through the prophetic use of the arts in church and formational ministry. It is her desire to portray the message of Christ’s desperate and unfailing love for His people to help sustain the hearts of the broken and weary. Life scriptures include Psalm 27; Isaiah 50:4-7; and Zephaniah 3:14-17. If you liked this won't you please share it?